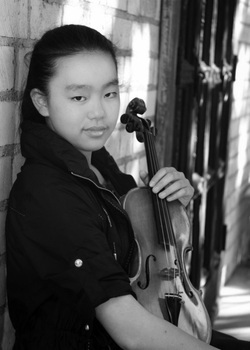 At the young age of fourteen, Kristie Su is already an accomplished violinist. She began studying the violin with her father and teacher, Elmer Su, at the age of three. Currently, she is a ninth grade student at Palos Verdes Peninsula High School, a distinguished high school in Palos Verdes. Kristie has won numerous competitions ever since she was eight years old, including the Erika Chary International Music Competition in 2004 and SYMF (held at Cal State Long Beach) beginning in 2004 until present. In 2005, she placed 1st in the MTAC Scholarship Awards. In both 2005 and 2008, she took 1st place in the ASTA Greater Los Angeles Finals. By 2006, she had won the Beach Cities’ Artists of the Future Concerto Competition (which she won again in January 2009), the junior division of Torrance Symphony Competition (and had another victory in 2008), the Bellflower Young Artists’ Concerto Competition, and the junior VOCE State Finals (and in 2008 again). Kristie also placed 2nd place in the Peninsula Symphony’s 29-under Concerto Competition in 2008 and the Bronislaw Kaper Awards (hosted by the Los Angeles Philharmonic at Disney Concert Hall) in 2009. In October 2008, she claimed first place in the All-State ASTA 18-under competition. In May 2009, she won the first prize at the Edith Knox Peninsula Symphony Concerto Competition. Most recently, she has won first place in the Parness Youth Concerto Competition and will be performing with the Culver City Symphony Orchestra in June 2010. This competitive teenager has also made many solo appearances with numerous orchestras, such as the Bellflower Symphony Orchestra in 2006, the Palos Verdes Regional Orchestra in 2006 and 2009, the Beach Cities Symphony Orchestra in 2006 and 2009, and the Torrance Symphony in 2007 and 2009. In June of 2009, she performed the full Glazunov violin concerto with the Peninsula Symphony Orchestra. Kristie has also been invited to play at the 2006 and 2008 Peninsula Music Fair held at Palos Verdes High School under the category of Rising Stars. In 2006 and 2007, Kristie sat first chair in the Palos Verdes Unified School District Intermediate School Honor Orchestra. She is also an active member in the Palos Verdes Regional Symphony Orchestra and her school’s advanced orchestra. In her spare time, Kristie enjoys reading, debating with her classmates, and ink drawing.